This is a bit of an in-joke… there are a few people who will understand it. I made this as a gift for one of my online mentors. 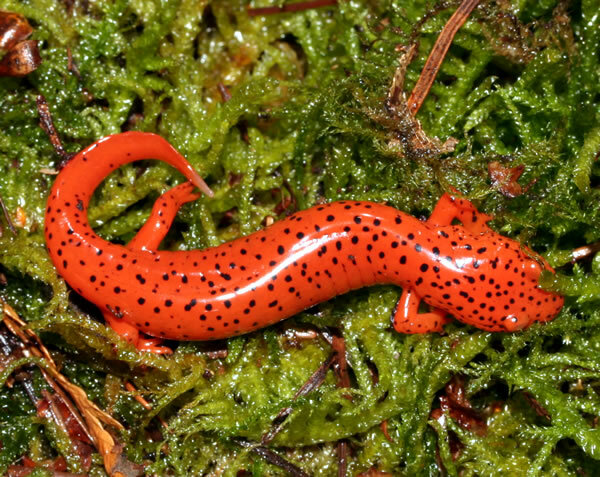 I based the graph on a photo of a red salamander that I found on Dartfrog. 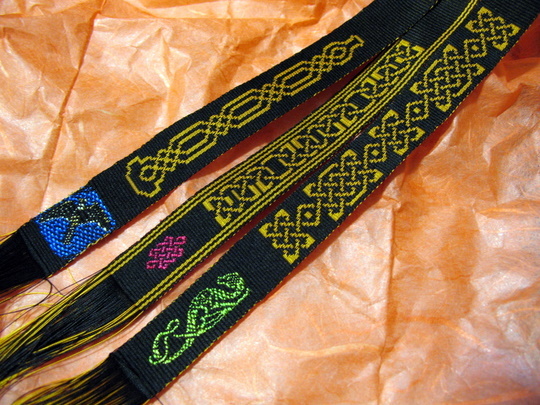 The ribbon is woven of 50-weight sewing thread; I bought it in black and white. The black is as I got it, the blue I dyed with acid dyes. The red is all silk that I made from cocoons and dyed. Originally published at WormSpit. You can comment here or there. 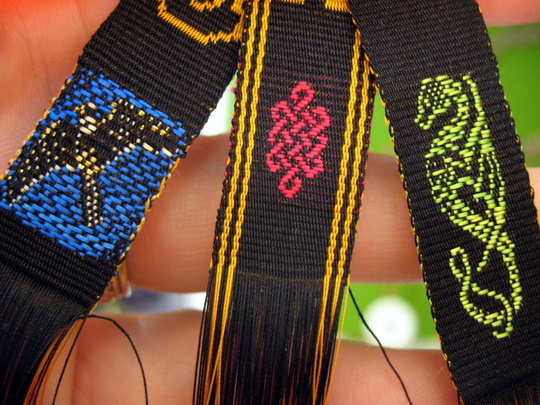 These are some ribbons that I’ve been working on. They’re not pressed or hemmed yet, but I just had to share! 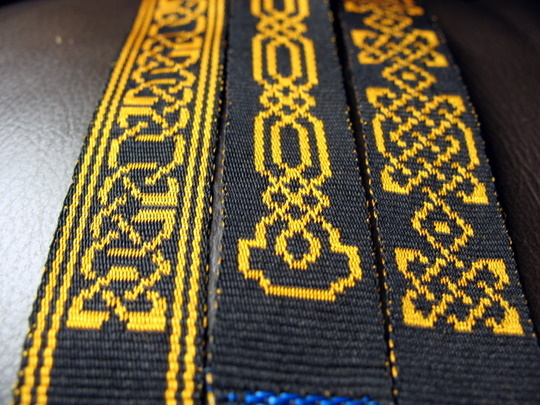 The gold and black is 50-weight sewing silk; I dyed the yellow, the black I bought that way. 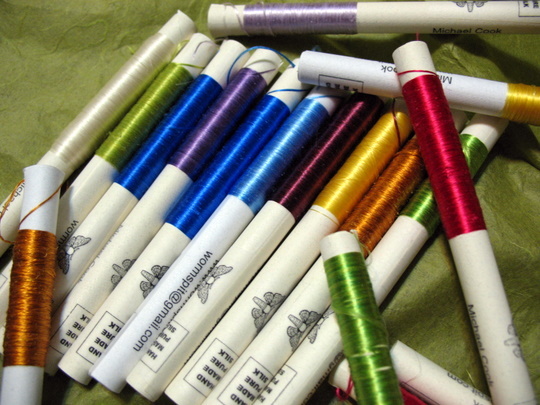 I wrapped some more of the little gimme spools. I’m pleased with the way they look! Taste the rainbow! The bright yellow that is #4 from the right… that’s NATURALLY that color. No dye. Sadly, the gold is all in the sericin, so it would come off with degumming. I’ve been working at getting ready for SOAR next month. One of the things that I absolutely have to have, is cool, small presents – I’ve always found that I make wonderful new friends at events like this, and I want to give them little mementos. It has to be something very cool, something very ME, and something they can actually get some use out of. So, I now present: Gimme Spools! 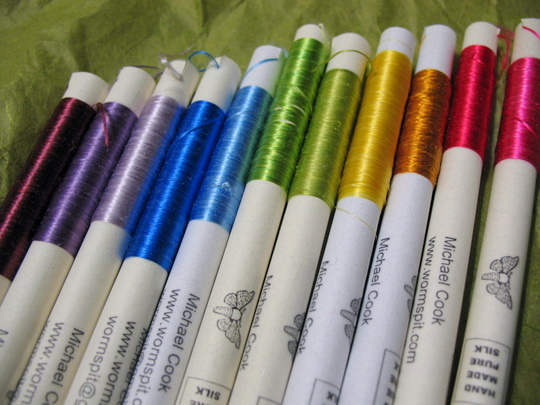 I had thought about getting spools like the ones I keep in my embroidery box, but (a) they’re almost $.50 each, which adds up when you want to hand something out like candy, and (b) they’re a special order item, so it could be a few weeks to get them here. I figured out that if I printed my information four-up on a piece of quality acid-free paper, I can cut them down and roll them up to make little quills. 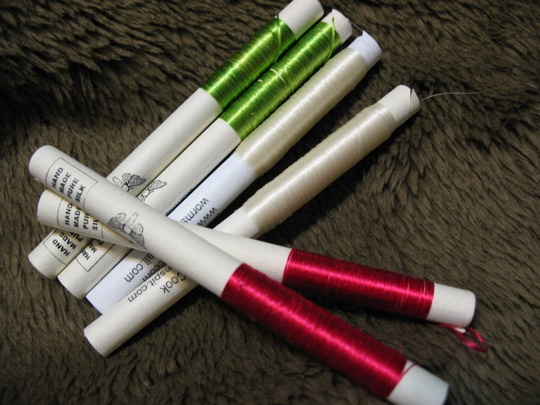 An extra-nice touch – I can use my electric winder, which turns a very tedious winding job into a quick zip. 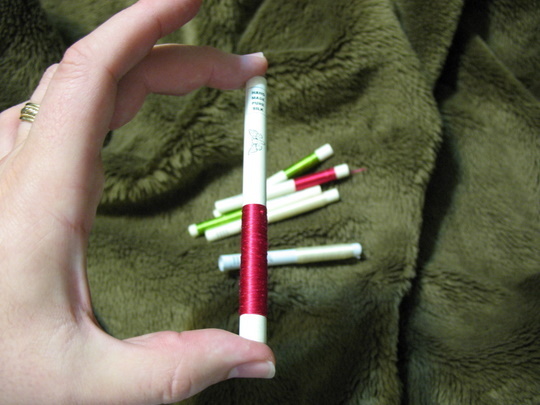 They’re a fairly convenient size – if I were just using them for storage, I might make them a little shorter. They’re not as strong as the Glimakra quills, but they’re pretty strong. 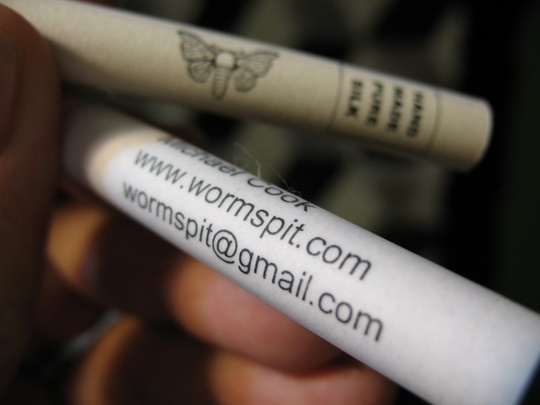 I like the fact that I can put all my info on them, like little silky business cards. They’re sealed with tape, which makes a nice smooth edge. Glue stick was too imprecise to make the edge clean. 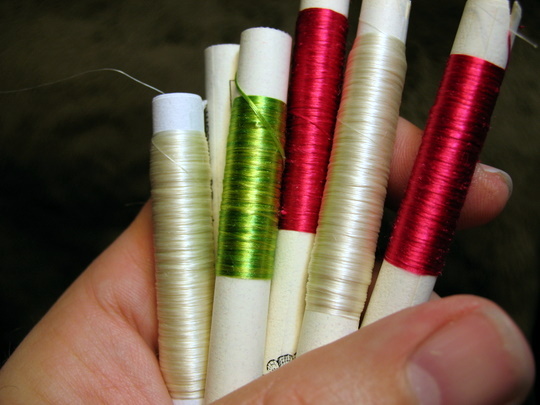 The colored ones have about 10 yards of embroidery tram, which would be enough to embroider an initial or a small flower. The cream ones are a bunch (100 yards? 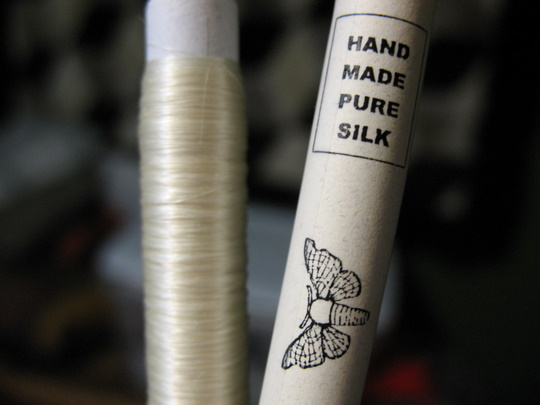 I didn’t measure) of raw silk filament, which could be thrown to make a small skein of almost any kind of yarn. I’m honestly not sure which people would like more. I’m hoping that people don’t decide they want one of each color… I can’t make enough for everybody to have a set.